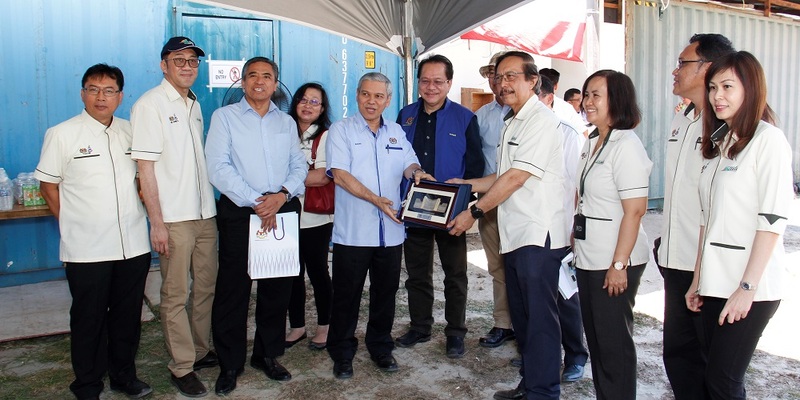 Kota Kinabalu (Friday) - Treasury Secretary General Datuk Ahmad Badri Bin Mohd Zahir today visited two Sabah Development Corridor (SDC) projects located within the Greater Kota Kinabalu area, as part of a three-day working visit to Sabah. The Secretary General had this morning visited the project sites of the Sabah Animation and Creative Content Centre (SAC3), followed by the KK Pedestrian Walkway and Cycleway. Datuk Ahmad Badri began his appointment as Treasury Secretary General on September 12, 2018. He has served in the public service since joining as an administrative and diplomatic officer on August 1, 1989, and had held various roles including that of Treasury Deputy Secretary General (management), National Budget Office Director, Strategic Investment Division Secretary, and Finance, Loan Management, Financial Market and Actuary Section Deputy Secretary. The Sabah Animation and Creative Content Centre was established under the SDC programme as an incubator facility to develop the creative industry, and has trained many school leavers in animation. It has also established collaboration with the University of Salford at Manchester, which is located within the world-renowned Media City@UK, to develop expertise in the animation and creative content industry. With funding through SDC, the centre upgraded information and communications technology (ICT) equipment, and the ability to accommodate 200 students. In supporting the establishment of a creative content hub, 61 jobs had been created, comprising of both academic and supporting staff. Furthermore, as many as 246 students have enrolled and 103 students had graduated in 2015. The graduates were also found to have achieved 81.6 percent marketability/employability. Parcel four (Central business district, 4.5 kilometres). In his remarks, Chief Executive of the Sabah Economic Development and Investment Authority (SEDIA) Datuk Dr Mohd Yaakub Haji Johari said these two projects are iconic to Sabah. He remarked that SAC3 is a significant project that contributes to the development of Sabah's human capital, and has already offered programmes in the creative industry to many young Sabahans as well as produced local content and entrepreneurs. One of SAC3's creations, the popular Sabah-based "Ondu" series, airs on RTM. He also said that "the walkway and cycleway project promotes an active lifestyle among people residing in the city, while supporting efforts to boost tourism. Kota Kinabalu in fact had been ranked among the top liveable cities in Asia in the 2017 Annual Overseas Retirement Index". In concluding the visit, Datuk Ahmad Badri said he was pleased to see how well the projects were executed. The Treasury Secretary General also thanked SEDIA as it had been instrumental towards the implementation of both projects, particularly as SAC3 is one of a kind in Malaysia. He noted the critical role that SEDIA had played in ensuring development of the projects, despite facing challenges along the way. The Sabah Development Corridor was launched on January 29, 2008 during the Ninth Malaysia Plan as one of Malaysia's five regional economic corridors, with the aim to accelerate the growth of Sabah's economy, promote regional balance and bridge the urban-rural divide, while ensuring sustainable management of state resources. This was followed by the establishment of SEDIA, through the adoption of Sabah Economic Development and Investment Authority Enactment 2009 on January 15, 2009. The Enactment was assented by the Tuan Yang Terutama Negeri Sabah on February 23, 2009, and gazetted on February 26, 2009. Through the enactment, SEDIA is vested with the necessary power to serve as a decision-making and execution institution that is tasked with realising the SDC vision and mission, by being the One-Stop Authority to plan, coordinate, promote and accelerate the development of SDC. Following a review of the roles of all government agencies and statutory bodies by the newly elected Federal government, the Authorities for the five Economic Corridors have been placed under the helm of the Ministry of Finance. As the One-Stop Authority tasked with implementing SDC, SEDIA is ready to provide its full cooperation with the relevant stakeholders in order to realise the continued success of all SDC projects, programmes and initiatives. The introduction of SDC has no doubt created greater awareness on investment opportunities in Malaysia's second largest state. Unlike other development corridors in Malaysia, SDC - an 18-year economic development programme - covers the whole state of Sabah. The corridor initiative uses a holistic development approach to ensure economic development benefits everyone in the state. Subsequent to the launching of SDC, SEDIA has been promoting Sabah, under the SDC investment tagline, "A preferred destination for business, culture and nature". With the advantages that Sabah has to offer, SEDIA has managed to attract tremendous interest amongst local and foreign investors into Sabah. Since the commencement of the Second Phase of SDC in 2011, SEDIA has been aggressively promoting investment into SDC. SEDIA has also adopted a more focused and targeted approach in attracting quality investments in new growth areas, especially in service-based, innovation-led and knowledge-intensive industries including in Industry 4.0. During the Eleventh Malaysia Plan, SEDIA has been according greater emphasis on improving the state's economic competitiveness by enhancing the state's global connectivity to ensure seamless movement of people, goods and services. Efforts would be directed especially towards enhancing the efficiency of the logistics sector by improving the relevant infrastructure and the integration of land, sea, and air services. In the long run, this will help in reducing the cost of living and doing business. Measures implemented under SDC thus far have succeeded in drawing investments into Sabah. By the third quarter of 2018, SDC recorded RM166.5 billion of cumulative committed investments, of which RM69.1 billion has been realised. Investments in SDC have clearly gained traction that, by 2017, Sabah recorded annual GDP growth at 8.2 percent, the fastest in Malaysia, overtaking all the other states in Malaysia and surpassing the national average at 5.9 percent, as reported by the Department of Statistics (DOS). The DOS observed that the rapid economic growth was driven by major government initiatives especially the implementations of SDC projects.